Listen, I love video game music. I think done right, it can elevate almost any game. I share Kirk Hamilton’s thoughts that games should feel musical- that the Super Mario series is better because of how musical the games are, how rhythmic the movement feels, how momentum builds as you go along. Other times, the music doesn’t click for me or I tune it out entirely. Atlus is probably one of the most stylish publishers around, in general. Their art direction is unmatched, and the character designs for the Shin Megami Tensei and Persona games are breathtaking. 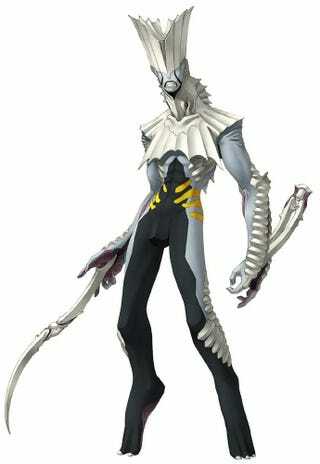 Digital Devil Saga has some incredible character designs and an interesting world- the game was originally developed to bring Shin Megami Tensei to a wider audience and this is reflected in the refind combat and simplified skill tree system. The player doesn’t have to memorize a compendium of beasts, just a few different movesets as they progress through the game. The game plays fast and the fights feel brutal- but it’s also super grindy. Like, really, really grindy. Going back through old levels once you have access to things you didn’t have access to before feels like a chore because there are random encounters what feels like every five steps. Even with auto attack on, it’s a lot. That’s when I noticed that I didn’t care about the soundtrack at all. I’m listening to it now as I write this, and it’s basically Muzak. Nothing sticks out. It doesn’t have any of the pep or enthusiasm of the Persona games, and doesn’t inspire any of the dread, tension, or heroism of Shin Megami Tensei. The theme song is awesome and I’ll go the mattresses to defend the opening cinematic of this game, but god the soundtrack is bland. When you’re just trying to run through a level to pick up any lost items or gain some extra experience, the soundtrack can really fade away if it’s not especially striking. That’s when I realized- hey, I can turn this soundtrack off and put something else on. And I did! Let’s see- I got into Digital Devil Saga at around 17 or 18 years old, so I was probably listening to My Chemical Romance, Queen, and musicals- so many musicals. Chicago and Cabaret were my favorites, probably still are. Podcasts weren’t on my radar yet and I wasn’t into the news, things that definitely take up a lot of my time now. I used to feel guilty about not giving a console game my full attention (handhelds were a different beast- given my penchant for playing either very early in the morning or very late at night, I’d often turn the sound down on my GameBoy for very pertinent reasons). Like the game would have it’s feelings hurt if I didn’t really invest myself in every aspect of it, from the script to the soundtrack. But putting something else on while grinding for experience in Digital Devil Saga made the game a whole lot more enjoyable for me. It’s weird- some games I still can’t do that with. Nintendo games come to mind. Stuff like XCOM, where I really love all the soundbites and getting spooked when I hear an alien off in the darkness. But it can be extremely empowering to put on your soundtrack when a game’s given soundtrack isn’t doing it for you.